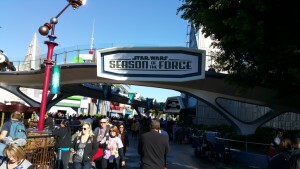 This week, Disneyland opened up “Season of the Force” in Tomorrowland, which marked a beginning of an increased Star Wars presence at Disneyland. 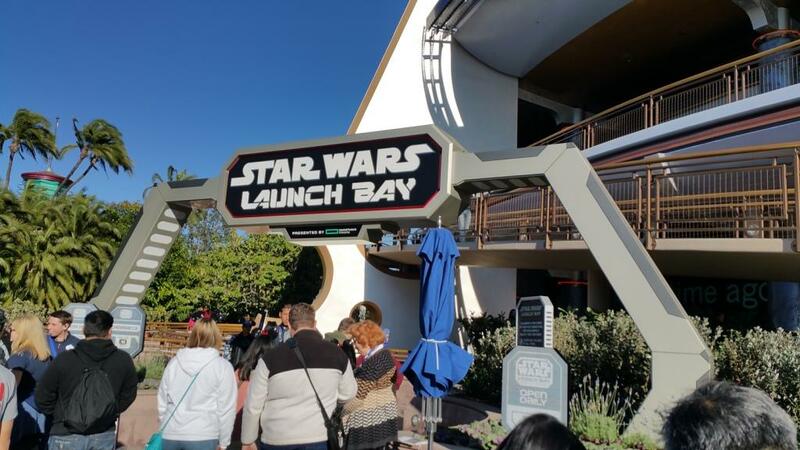 While it may be temporary, it is certainly an exciting move towards more Star Wars at Disneyland, especially in the Tomorrowland section, which has needed an injection of new life. The first thing one notices upon entering into Tomorrowland is the aural landscape provided for the visitor, with a variety of songs from the movies, which is a very smart move. There are also posters lining one edge of the erstwhile WED People Mover in blue and green featuring Jedi and other protagonists, while on the other side of the people mover are red and black posters featuring Sith and other antagonists. While Star Tours remains mostly the same, with two “missions” on the flight, the first of these two takes the rider to Jakku(! ), which is neat to get a little bit more of a feel for the planet than the trailers provide. As usual, the ride empties into Star Trader, allowing for the perusal and potential purchasing of Star Wars paraphernalia (albeit pricey). 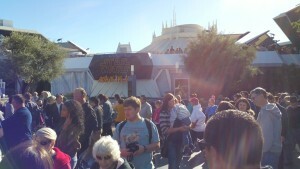 Space Mountain gets transformed into Hyperspace Mountain, although I did not ride it. The Captain Eo space got turned into “Path of the Jedi”, which is really neat: it focusses on the Jedi in Episodes I-VI and takes us to scenes in “The Force Awakens”, although nothing not already previously shown in the theatrical trailer. It is quite an enjoyable experience, since it is not simply watching a screen: there are lights, vibrations in the theater, and a great sound system. At the end, I got the feeling I wanted to immediately go out and watch Episode VII! Finally, there is the Star Wars Launch Bay, which takes over the first floor of Innoventions and primarily features artifacts from “The Force Awakens”, as well as other Star Wars movies. It was quite fascinating to see not only the costumes and ship models (amongst other things), but also to read the descriptions. For me, the most fascinating find was that Anakin’s and Luke’s lightsaber that Luke lost while fighting Darth Vader “on Cloud City, but someone salvaged it from the city’s industrial depths”, which is an interesting hint towards the new movie. There is also a neat several minute video with various Lucasfilm folks, which is enjoyable. 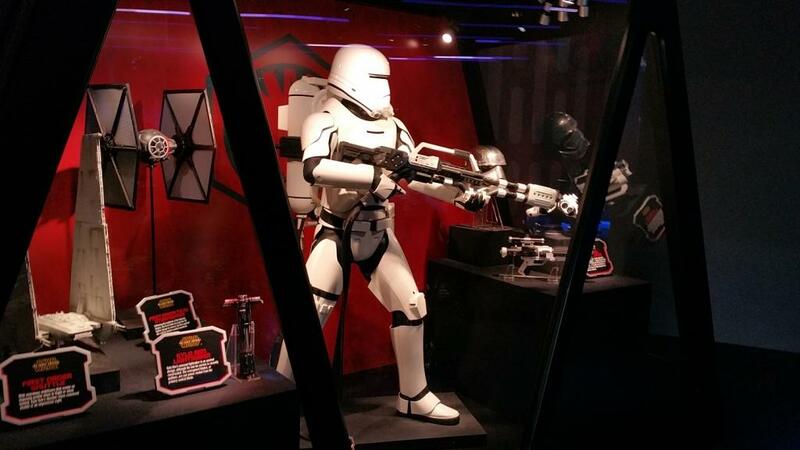 While in the Star Wars Launch Bay, one can meet a character or two, as well. As one is leaving this area, there is a merchandise area, which has mostly “The Force Awakens” items for sale. With a name that implies temporary-ness, it is unclear when “Season of the Force” will conclude, but it seems that it massive marketing effort gearing up for “The Force Awakens”. What happens comes 2016 is unclear….